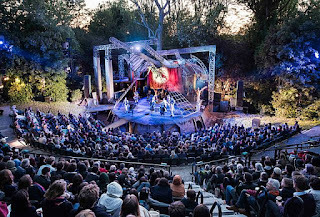 Early this month I saw Peter Pan at Regent’s Park in a version, directed by Timothy Sheader and Liam Steel, that was conceptually brilliant, visually breathtaking and deeply moving – the most thrilling evening I spent at the theatre in a month of seeing plays in London. James Barrie wrote Peter Pan in 1904, but Sheader and Steel have set it a decade later, during the Great War. Jon Bausor’s set looks initially liked a bombed-out factory framed by scaffolding and derricks, on one of which hangs a tattered Union Jack; beneath is a trench erected from torn sides of metal and random lumber. A bomb explodes and the factory turns into a military infirmary where a handful of nurses tend to the wounded: to one young man whose eyes are bandaged, to another who cries out in agony for his mother, to a captain who is fitted for a hook to replace his blown-off hand. One of the nurses (Kae Alexander) retrieves a copy of Peter Pan from under the pillow of the bandaged soldier (Patrick Osborne) and begins to read it aloud to the entire ward, and the play within the play begins. The nurse turns into Wendy Darling, the bandaged soldier (who knows the text off by heart and recites some of it along with her) becomes her brother John, and the rest of the soldiers and nurses in the ward take the other roles. 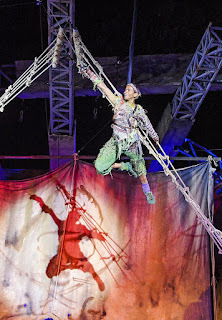 Other uniformed men are stage hands, scaling the heights of the set to manipulate the harnesses that hold Peter Pan (played by Hiran Abeysekera, he’s the only actor on stage who appears only as a fantasy figure) and the Darling children (Thomas Dennis is Michael) as they fly through the air. Naturally, the captain who has lost his hand (David Birrell) shows up again as Hook. At first it’s not obvious how Sheader and Steel are linking Barrie’s story with the First World War, but the elements of their vision come together in the course of act one. It’s easy to see that the badly injured young man who cries out for his mother from behind a screen in the infirmary is a touchstone for the homesickness of the Lost Boys who have become separated from their mothers, for whom Wendy is intended, in Peter’s scheme, to be a substitute. We can foretell that in the second act, when Wendy decides to take them back to London along with her brothers and give them a real home rather than a pretend one, we’ll be thrown back emotionally to the boys on the front and in the hospital ward, aching not just for the peace and comforts of home – which many of them would never taste again – but in an essential way for the childhood innocence that battle has removed them from forever. A woman in a fin-de-siècle gown (Melanie Pappenheim) appears at the top of the show and several times afterwards, singing WWI-era ballads like “Keep the Home Fires Burning” and “There’s a Long, Long Trail A-Winding” (while the ensemble of soldiers sometimes breaks into marching songs like “Pack Up Your Troubles”); she’s the spirit of Edwardian England, of which Peter Pan is an enduring symbol – the age that was shattered forever when the war erupted. It’s the upper-crust Edwardian home that Barrie is parodying in the section of the text where Peter and Wendy play father and mother to John, Michael and the Lost Boys in the house the boys have jerry-rigged; here that section has a built-in poignancy because we know that the boys on the front can never get back to that Edwardian home. We feel the urgency when, immediately after this scene, the Lost Boys in their beds tell Wendy how much they still miss their mothers and, on the spur of the moment, she makes up her mind to take them home. But Sheader and Steel’s idea is even more daring. They have reimagined Neverland as a metaphor for the war itself, the adventure that young men were thrilled and seduced by that turned out to be hell. For all wars, really: Jon Morrell has dressed Hook’s pirates as a crew of warriors from different historic periods, including one – my favorite – who looks like a Technicolor-fantasy rendition of one of Dumas’s Musketeers. (Smee, played by Beverly Rudd, a memorable Lucy Lockit in the Regent’s Park Beggar’s Opera, wears the costume of a Crusader, but her headdress appears to be a tribute to the John Tenniel illustration of the Duchess in another English nursery classic, Alice’s Adventures in Wonderland.) That notion lends an almost unbearable sadness to Peter’s line to Wendy (when they almost drown on Marooner’s Rock at the end of act one), “To die would be an awfully big adventure,” and a satiric bite to the moment when, after the pirates have captured the Lost Boys and the Darling children and Hook offers to make John and Michael his cabin boys, John replies that they would rather die like English gentlemen than abandon their loyalty to King George. The climactic battle goes on too long and is the only clumsy piece of staging in the production – perhaps because the directors don’t really believe in it as a fantasy construct without real emotional weight. But the death of Hook, the only one that matters, is mournful and horrifying. The crocodile that got his hand and has been tracking him ever since is a large horizontal puppet stitched together out of stepladder, a Union Jack, a pair of lanterns and some ripped metal (three puppeteers work it); when it swallows Hook, he sinks into its jaws as if into quicksand. The ominously ticking clock, from some other feast, that announces the crocodile’s proximity becomes, in this context, a symbol of time and fate, inevitably catching up with the battle-scarred Hook to finish him off for good. The trench beneath the playing area is a constant reminder of the war; so are the puppets designed by Rachael Canning and the props, which are wondrous patchworks of recycled war materials (an idea that also alludes to wartime shortages and belt-tightening). Tinker Bell (manipulated by Rachel Donovan, still dressed in her nurse’s costume from the frame story) is a toy figure with a small flashlight for a face and a lantern torso; when she drinks the poison intended for Peter, the lantern light turns scarlet. The pirate ship is a blown-up life raft on wheels with a black flag on a branch hovering above it. A duck floating on the water has a head and neck of cloth hooked to an attaché case inside a life jacket. The mermaids in the lagoon are made of metal, with gas masks for faces and cloth fins. The beds from the infirmary make numerous reappearances. For instance, they are part of the fabric of the Wendy house (which has a soldier’s boot as a door knocker and a metal cylinder with a helmet over it as a chimney, and the roof is made of metal siding), and when Peter and Wendy are in peril of drowning on Marooner’s Rock, a pyramid of them, along with the bodies of soldiers, suggest the rising tide. The handmade quality of these objects reminded me of the last version of Peter Pan I saw, Peter and the Starcatcher. Normally productions of the story – certainly of the insipid musical version that, continually revived, is the version most people are familiar with – go to great lengths to conceal the wires that enable Peter and the Darlings to fly, but here they are harnesses in full view of the audience. The flying – and even more the acrobatics required of the stage hands (“show climbers,” as they’re called in the program) to effect the flying – becomes part of the adventure of wartime, simultaneously fantastical and dangerous. The style of the acting is playfully stylized; it made me think of Story Theatre, which I saw on Broadway in the seventies, and though I’ve never seen any myself I assume that for English audiences it’s reminiscent of Christmas pantomimes. Barrie wrote in one panto moment, when Tink is dying of the poison she drank for Peter and he turns to the audience and implores us to save her life by clapping loud to show that we believe in fairies. There’s probably no way to omit this famous scene, but even though the style of Sheader and Steel’s production is at least part Brechtian (and part theatricalist, like Our Town), this single instance where the fourth wall is overtly broken is the one scene that doesn’t work, because it’s the only scene that doesn’t score with the World War I concept. (It feels like a holdover.) The whole ensemble executes the style skillfully, but Abeysekera and Alexander as Peter and Wendy add grace notes to their performances, he with his exuberance, she with her poise and pensiveness. It’s not because Abeysekera is the leading actor that he’s the only one on stage who isn’t double cast in the frame story and the Neverland narrative. He’s the boy who never grows up, the one who continues to believe in the glory of the big adventure; he has no place in the real world where soldiers and nurses have to deal with the consequences. At the end of the play, he can only sit in a tree and watch as the play returns to the military hospital. The war is over and the nurses are celebrating. Some of the soldiers describe what coming home meant to them. Some are silent, hovering, and we realize they’re the ghosts of the boys who didn’t come home at all – and it occurs to us with growing horror that the soldier who took on the role of John, sitting once more on his bed downstage left where the nurse found his copy of Barrie’s story, isn’t speaking either. At the end, this young English gentleman who fought valiantly for King George joins the ghosts marching off stage. This is the first Peter Pan I’ve ever seen that made me weep. A friend of mine who is a superb director claims that a good show should be clear to a nine-year- old as well as a fifty-year-old, and though there are obvious exceptions, that strikes me as a pretty good rule of thumb. A corollary to that principle ought to be that the honor and respect that are due to an adult audience should also be due to an audience of children. 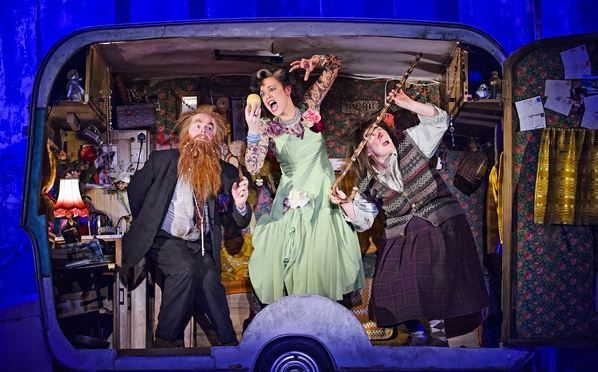 That’s why the adaptation of Roald Dahl’s The Twits at the Royal Court is, I think, unconscionable. Directed by John Tiffany (who helmed the productions of Once and The Glass Menagerie that began at American Repertory Theater and went to Broadway) from Enda Walsh’s adaptation (she did the adaptation of Once), with Tiffany’s favorite collaborator Steven Hoggett officially blamed for the “movement,” The Twits is a cacophonous, wretchedly acted mess. Its only virtue, besides Monica Dolan’s wickedly funny parody of the queen delivering her annual Christmas address and five minutes when she and Jason Watkins, in the title roles, extend their misanthropic characters in an improvised exchange with the audience, is Chloe Lamford’s set. This is a circle that looks like a drum placed on its side that opens up to reveal first one and then another layer underneath. (It also, inevitably, spins around.) The aim of The Twits appears to be not to entertain kids as much as to keep them distracted for a couple of hours. 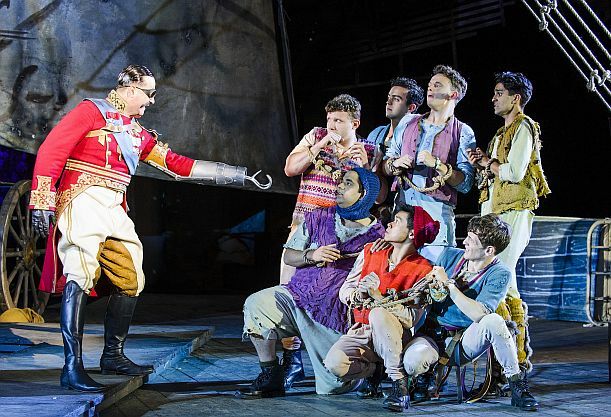 The matinee performance I saw, in the middle of term break for London schoolchildren, had that effect, and the show sold out its run, whereas Peter Pan didn’t, though it received enthusiastic reviews. Parents who read them may have been scared off by the darkness of the concept, which would certainly have narrowed the potential audience to older children (and above). But I can’t imagine young playgoers keeping The Twits in their heads for more than a day or two, while the kids who were lucky enough to be taken to Peter Pan at Regent’s Park may remember it for the rest of their lives.